Today we visit Utah with The Monkey Wrench Gang by Edward Abbey. EW says - "Abbey's tale of four ecological activists seeking to destroy the Glen Canyon Dam became a primer for other green-minded saboteurs." The Monkey Wrench Gang by Edward Abbey is touted as a comic look at social justice warriors. True environmentalists that strive to bring the land back to its natural state. Um, no. That is not at all the book I read. What I read was a book steeped in misogyny, homophobia, stereotyping and stupidity. From the derision of Native Americans, to showing the only Mormon member of the group as a polygamist, this book played everyone as a buffoon. The plot was a grand look at what a bored drunk man will concoct when he gives no thought to others. George is painted as a lover of the natural state who is upset by the creeping industrialism on the desert he calls home. He decides that action must be taken, extreme action. Because blowing up bridges is cool but littering is just fine - "Of course I litter the public highway. Every chance I get. After all, it's not the beer cans that are ugly; it's the highway that is ugly." The writing was a mishmash of clichés and was difficult to read at times due to the constant changing of tone and pace. The world built was also difficult to navigate as locations moved frequently and at times I was unsure what state they were even in. The emotions and the characters were also all over the place. Everyone but the "gang" was painted as ignorant and useless and it became quite grating. Some books get better with age and become classics. 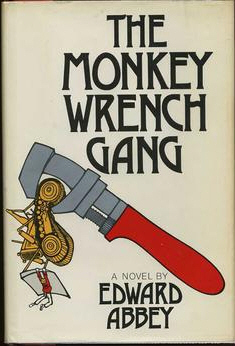 The Monkey Wrench Gang is not one of those books. It was a draining experience to read it and I cannot understand why it is considered by many to be so good. It has a 4.3 star rating on Amazon but I cannot fathom how. An example of the comedic showcases, to me, what was once thought great, but I just see it as super lowbrow. As for the connection to Utah, I did not really see it as an overall. Utah was not mentioned until 60% into the book and then as more of a joke (see the polygamist). Sadly my home state of Arizona fielded most of the action with New Mexico coming in second and Utah as third. The Glen Canyon Dam, the featured target, is also in Arizona not Utah, so again, I have to wonder if the EW staff read the books before placing them in the states. Favorite lines - The river in its measureless sublimity rolled softly by, whispering of time. Which heals, they say, all. But does it? The stars looked kindly down. A lie. A wind in the willows suggested sleep. Biggest cliché - I will save you even if you do not want saving.